Venables Brothers is one of the few timber merchants in the UK to carry large stocks of fresh sawn (green) and air dried oak beams. This helps to achieve a quick turnaround for standard sizes. We also supply kiln dried oak. The company has a thorough knowledge of the different methods of sawing and production and of the end use of oak beams. 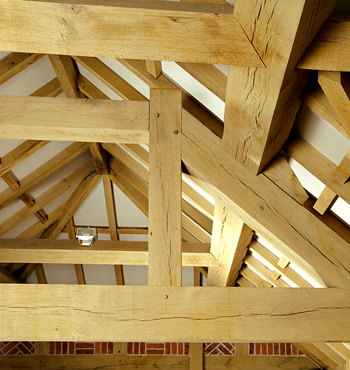 Venables Oak is popular with self builders and with timber framed building specialists alike. Director Chuck Venables advised the Building Research Establishment (BREEAM) on the development of the British Standard for the grading of oak beams. He was the first grader in the UK to be certified to grade BS5756. From green oak for a new build to kiln and air dried oak for a complex restoration project, the company offers a complete advisory service on any issue. Other sizes and different grades tailormade to the clients’ requirements are easily available. Venables Oak also supplies dock blocks, marine timbers and fencing oak. Download our European Oak beams Information PDF so that you have the information you need at hand.